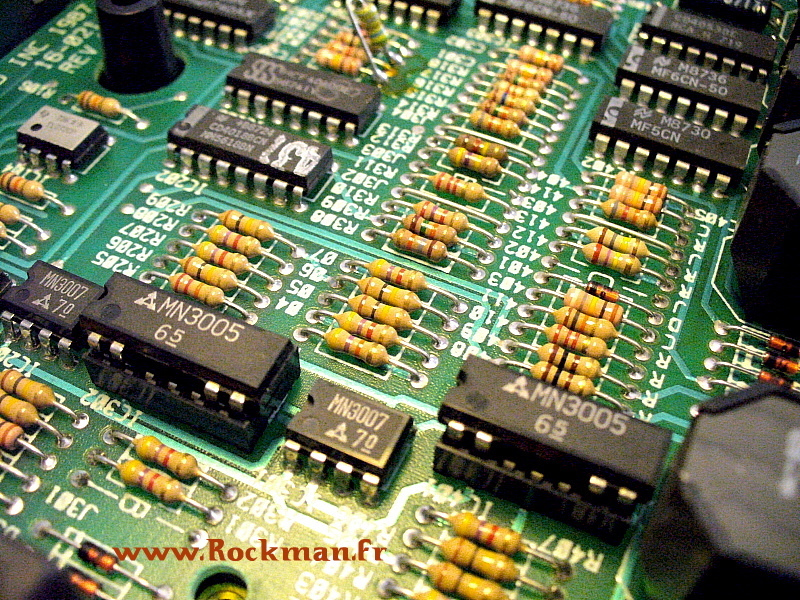 The Rockman Stereo Echo is often considered as the Holy Grail of the analog delays. There aren't many quality analog delays on the market, especially since this technology was replaced by the cheaper digital technology. 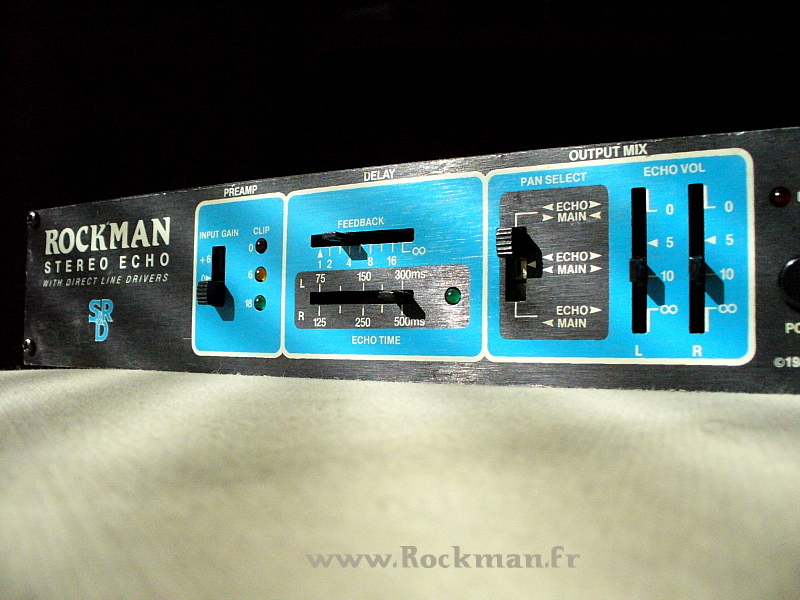 The Rockman Stereo Echo not only uses state-of-the-art analog circuits, its functional design was, like every other Rockman unit, performed by a musician for musicians. And that makes a huge difference. The Stereo Echo was issued along with the Stereo Chorus when the Chorus/Delay was discontinued in 1987. And the delay section of the older C/D looks really simple compared to the highly improved Stereo Echo! While the Chorus/Delay was limited to doubling, slap-back and reverb-like short echoes, the Stereo Echo can deliver these huge walls of sounds that a tape echo can give. As a matter of fact, the filters of the Stereo Echo were designed for this warm, tape-like sound - nothing like the cold feeling of a digital unit. The stereo effect of the SE is unique: the left channel delay is always equal to 3/5 of the right channel delay. This ratio was introduced to avoid taps overlapping: the echoes interleave from left to right and right to left without crossing path. This special feature allows the Stereo Echo sounding a little like a reverb - something that no classic delay can do. Just like the Stereo Chorus and the Chorus/Delay, the Rockman Stereo Echo includes the compandor noise reduction circuit. This is one of the key features that make it sound clean, when the common analog delays are fairly noisy at long delay settings. There are four BBD chips inside the Stereo Echo, which are connected in series. The Left Channel - short delay - is picked up after the third chip, and the last chip provides an extra delay for the Right Channel. The following chart is a simplified diagram of the Rockman Stereo Echo's structure. The right input channel is left untouched, and is mixed towards two outputs with the original left channel, the short delay and the long delay to achieve the desired stereo image. The Rockman Stereo Echo has very rich features, and a guitarist will certainly never find the limits of the unit: from discrete slap-backs to huge walls of sound, the Stereo Echo will meet his requirements. The Stereo Echo is becoming difficult to catch at a decent price. It was produced in the same quantity as the Stereo Chorus - approximately 6700 units - but people who can buy one do keep it, and a lot of collectors own several of them. The Stereo Echo doesn't steal its reputation: it is an outstanding unit, that really has no competitor on the market - unless you prefer digital to analog gear.